Having established a Way of Stability through the facility of Sacred Breath, today, Tone 5 introduces us to the Source of Power that will fuel our Spirit’s Revival. The Highest Spiritual Consciousness we could hope for is a Communion with the Creator that requires no Faith. Our Quest is a journey in search of the Evidence that would elevate our Faith to Knowing. Night/AKBAL brings this Power for Knowledge as the Voice of Spirit that Speaks to us in our Dreams. AKBAL draws us into the Darkness of the Unknown, where we will be guided by the Light of Spirit. Tone 5 brings the Power to manifest our Intention. AKBAL will show us how something still Unknown has the Power to make the Impossible Possible. Night/AKBAL empowers us to Believe Miracles Are Possible. 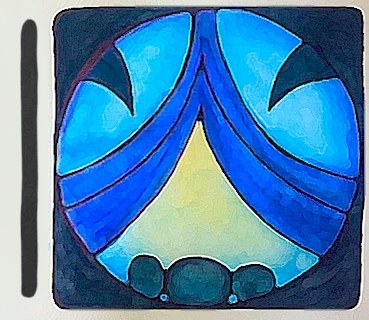 The AKBAL glyph illustrates curtains drawn open to reveal a Source of Light in the Darkness. AKBAL reveals something we’ve been incapable to see with our Human eyes. Through the Eyes of Spirit something can become apparent and clear. This is an important day to Acknowledge our Dreams and our Feelings. We could take note of any waking dreams we had this morning, or excursions of thought throughout the day. The message may not be as important as recognizing the evidence of a communication. I remember an experience from childhood when I wanted to See God. I was at a church retreat and we were sent to the wilderness to meditate on scripture. I was trying so hard and waiting. I satisfied myself by looking at a blade of grass and prepared to leave. As I stood up, I realized my proximity to an outcropping that provided an expansive view of the river. It had been in front of me all along. Leaning on our own understanding, we can search for evidence that is right in front of us all along. We may not yet have the understanding to know exactly what we’re looking for. AKBAL can give us direction with a little bit of Light. Blue Day Signs generate experiences through our Emotions. Today our Heart can reveal the evidence of Spirit. This is a day to allow our Feelings to be brought to the Light. AKBAL works to bring Power through something hidden in our unconscious thoughts. This week I’ve been visited by the Spirit of a chosen Sister, one of my greatest teachers who was disguised as a friend. As synchronicity mounted evidence of her presence, I realized I’d begun the trecena with her favorite song, “Hallelujah.” It’s reminded me of just how much evidence we can accumulate before something may capture our attention. The Cherokee Day Sign of The Hearth is the Sacred Fire that burns in the Night and the place where the Ancestors are always present. “The Hearth is the Torchbearer who holds the light and warmth throughout the night. Belief is so strong that the surrounding elements become entrained to their rhythm and all resistance falls away. With respect and honor of intuition combined with knowledge this energy creates the magic of the center in this dimension.” As we Acknowledge our own Intuition and Knowledge as Truth, the resistance of our own disbelief falls away. AKBAL’s energy can be experienced as “dreamy.” We may find ourselves lost in our thoughts and daydreams. We are asked to look for the Light of a new reality. The Light of our own Highest Faith, leads us to a threshold – the tipping point, where Faith can be elevated to Knowing. To all my relations, may we willingly face our own darkness. May we honor the feelings that can lead us to evidence of a Spiritual Communion. Through an opening of the Heart, something Unknown can become Known. May we seek the Light that is found in our Inner Voice. Through the Acknowledgement of the smallest signs of Light, we can draw near to the Source of Wisdom that is Known by the Ascended Masters. 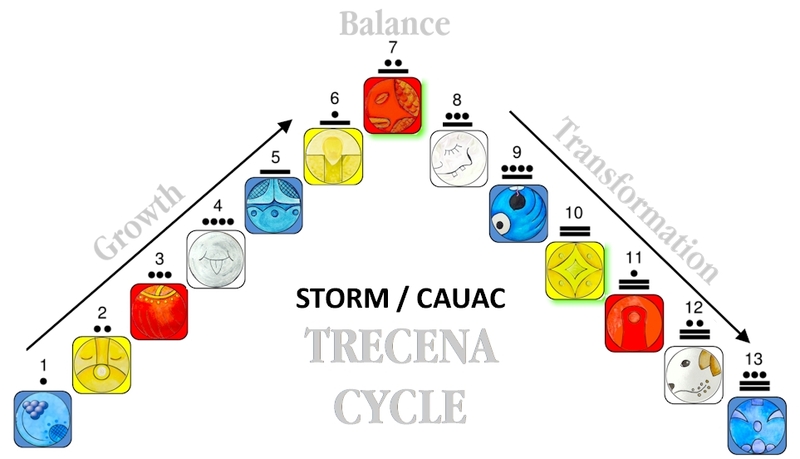 Visit the 13-Day Trecena Guide for a daily energy forecast with insight on the Uinal and Portal Days of the Storm/CAUAC trecena. Night/Akbal: Bringers of the Dawn. Dreamers who bring the new sun to clarify and illuminate the road of life. Thus the insecurities and doubts born of darkness of the sub-conscious mind are dispelled. These persons travel the Void… a place where nothing yet exists but all potential dwells, the womb of creation. From this void, Night persons bring forth new solutions and artistic inspiration. Night’s voyages of dreams build confidence and happiness with a sense of well being. If night does not bravely journey into the void they may find themselves wandering the darkness of self doubt and insecurity. Cherokee, Hearth/O’YA: Hearth’s symbol is the fire pit in the Center, velvet black as the night. The triangle in Orion. The M42 nebula (home of the Central race from the WingMakers) in the center of the triangle of Orion is the fire in the Hearth, also matching the Mayan. The Hearth is the Torchbearer who holds the light and warmth throughout the night. Belief is so strong that the surrounding elements become entrained to their rhythm and all resistance falls away. With respect and honor of intuition combined with knowledge this energy creates the magic of the center in this dimension. AKBAL-Night-Totem-OWL: Guardian of the Night Sun. Energies for the opening of mystic secrets, seeing through the masks of deception, trickery. High ability of discernment. Portals open to other worlds and dimensions for your learning and spiritual growth. Magical abilities are possible.